You may have heard us talk about the innovative Quooker before. Well, now there’s something even better for you to consider for your kitchen – The “Quooker Combi”. The original Quooker is a boiling tap which heats the water to 100°C so that the water dispensed actually comes out at that temperature. 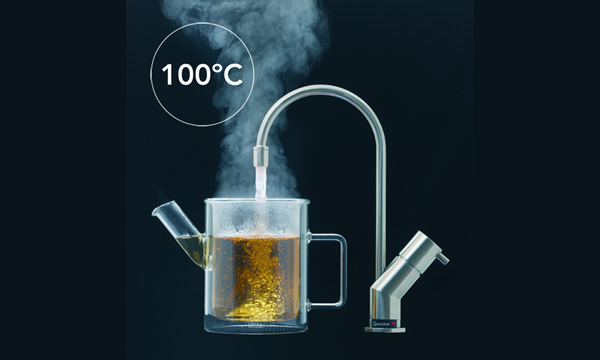 Well, the new Quooker Combi is even better and more versatile. This handy little add-on means you can also connect it to your existing hot water tap to dispense instant hot water (at around 50-60°C to your sink) – ideal for faster, more efficient washing up. Time: You don’t have to wait around for your water to heat up anymore. Energy: The Quooker is extremely well insulated and energy efficient. Water: Just imagine how much money you could save if you stopped using the gallons that get wasted while you are waiting for the water to get hot. Whether you’re looking to install a boiling tap for its time saving ability, its energy efficiency, its general convenience, or just because you fancy the idea of losing the tedious kettle-boiling time, the Quooker is the perfect choice. The Quooker tap comes in a variety of designs and finishes, from modern to classic, and includes polished chrome and stainless steel. Still unsure? Take a look at our demo videos to find out just how useful they can be to your kitchen.